36° 20.622′ N, 82° 15.023′ W. Marker is in Elizabethton, Tennessee, in Carter County. Marker is on West Elk Avenue (U.S. 321) west of Franklin Club Drive, on the right when traveling west. Click for map. The marker is on the edge of the Sycamore Shoals State Historic Area. Marker is at or near this postal address: 1651 West Elk Avenue, Elizabethton TN 37643, United States of America. 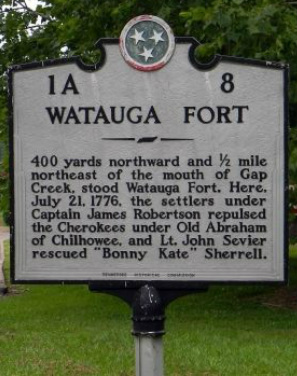 400 yards northward and mile northeast of the mouth of Gap Creek, stood Watauga Fort. Here, July 21, 1776, the settlers under Captain James Robertson repulsed the Cherokees under Old Abraham of Chilhowee, and Lt. John Sevier rescued “Bonny Kate” Sherrell.